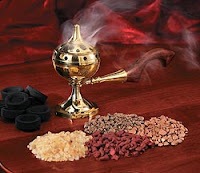 Incense is an important component in formal rituals (like in Wicca or Druidry), used to represent the element of air. It's also useful in meditation, visualisation or spellworking (which, for me, is effectively a kind of visualisation with focus objects). Incense is said to have been used in religious ceremonies for centuries as a means to carry offerings to the Gods. Traditional ground incense, made from valuable spices, fruits and resins, is smouldered over charcoal to allow its scent to be carried via smoke. The reason it is useful in religious practices including ritual, visualisation and meditation is that it often includes ingredients such as Frankincense, which has the physical property of regulating breathing. This obviously has a calming effect and aids participants to focus. Many new age and magickal supply shops sell a huge range of granular incenses these days, as well as the charcoal tablets and bronze censers, which can be found in pagan-friendly designs. Themed incenses for particular intents, or to work with specific deities are readily available, or you can make your own (although this is something I've never tried personally). I must admit to being a bit of a sucker for incense blends. I have them for the four elements, various intentions (divination, healing etc) and some specific energies and themes (e.g. a Green Man one and an Egyptian one).